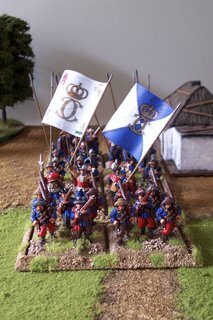 The Våstergotar infantry regiment marches into Poland, one sleeve of 10 shot in front of 20 pike and another 10 shot bringing up the rear (2 more foot units to paint plus 1 painted Scots regiment). Karl X introduced uniforms for all regular Swedish infantry regiments, so far my research shows 15 in total. The flags are from the later period of Karl XI (Karl X's son). 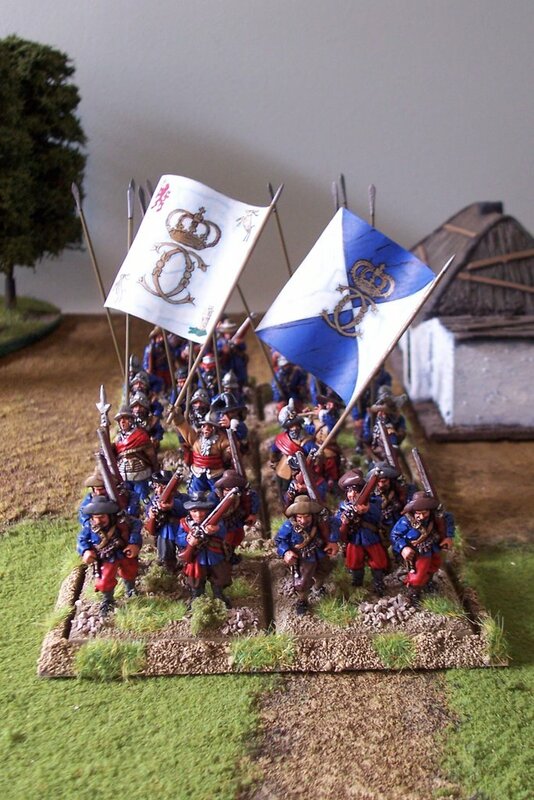 I am waiting to pick up several books on Karl X's army which also depict his flags. I am going to Norway at Christmas with my partner and I will go across to Stockholm for several days and pick up these books and have another look at the excellent Swedish Armee Museum. The museum is highly recommended, it has loads on the TYW and GNW and they even have a large model diorama there from the TYW using several thousand 30mm foot and horse figures from the Swedish model manufacturer Tradition (wouldn't mind wargaming with that).